Can Detroit Be Saved? Michigan Gov. Rick Snyder announced Friday that the state would be taking over Detroit's finances. 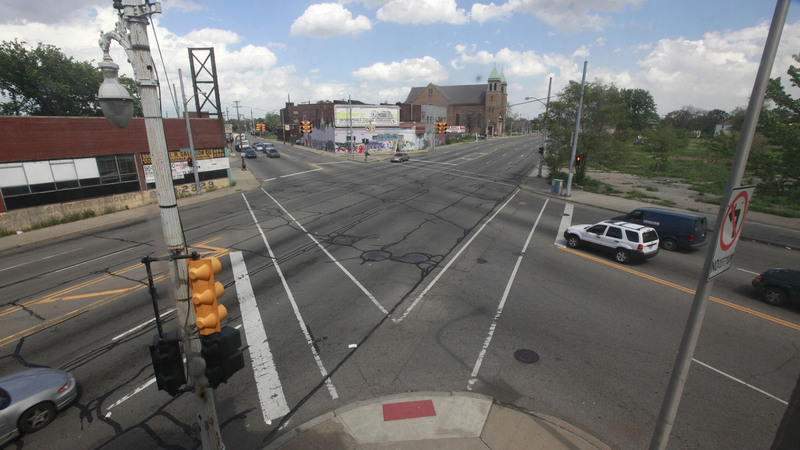 But the intervention might not be enough to pull the city out of a $14 billion hole. It would be the largest municipal bankruptcy in the country, if it happens. Michigan is taking over Detroit's finances and will appoint an emergency manager to deal with the city's massive debt. Detroit is broke. On Friday, Michigan Gov. Rick Snyder announced the state will take over the city's finances. "It is time to say, we need to start moving upward with the city of Detroit," he said. But the question on many people's minds is whether state intervention will be enough — and whether the more ominous and painful scenario of municipal bankruptcy can be avoided. "The city could stop doing all of its current operations today — no more police and fire, no more garbage collection, no more street lights — and the city would still have billions of dollars of debt and promises made for future payments that it would have to pay." Detroit has more than $14 billion in long-term debt. It's on track to run out of cash within months. Meanwhile, it continues to face a steep population decline. Getting to solvency will be a challenge, to put it mildly, for the person the governor picks to be Detroit's emergency manager. Michigan's longest-serving emergency manager, Lou Schimmel, oversees the books in Pontiac. He's slashed jobs and put just about every city asset — parking lots, a landfill, even City Hall — on the auction block. Schimmel says Detroit's emergency manager will certainly need to deal with its unmanageable labor and infrastructure costs. But he says bankruptcy might not be avoidable. "It would be unreal to think that that might not have to be part of the solution," he says. Municipal bankruptcy is relatively rare. Stockton and San Bernardino, Calif., are both going through the process. Jefferson County, Ala., has the dubious honor of the largest filing to date, at more than $4 billion. Those cases are dwarfed by Detroit both in terms of population and liabilities. "It's going to be the largest municipal bankruptcy, if it does happen," says municipal bankruptcy expert Eric Scorsone, who teaches at Michigan State University. "It's very large-scale, it's going to be incredibly complex, and really a lot of issues and a lot of creditors to work through," he says. Among those who could be asked to take a hit are pensioners like Sandra Brunson, who just retired from the Detroit Police Department in October. On her dining room table sit framed acknowledgements of her 35 years there and a giant retirement card. Brunson says it was bad enough that her pay and benefits were slashed during her last years with the department. She says the city needs to keep its promise to its retirees. "Even though it's a fixed income, you want it to be fixed. You know, you've heard rumors about elderly people having to eat cat food, dog food, not being able to get their prescriptions, they only can get half ... that's terrible," she says. Brunson moved out of the city when she retired, and her reasons say plenty about Detroit today. "I didn't feel safe. I lived in a gated community in Detroit the last five years, and I was scared before getting to the gate," she says. Snyder and others hope state intervention can help stabilize the city so it can protect residents and reliably deliver services. The governor says he wants to avoid bankruptcy if at all possible, but acknowledges the threat of it could bring creditors to the table. No matter what the process, though, observers like Schimmel say the real test will be what comes when the city balances its books. "Once you get to that point, I think the biggest question is how are you going to keep it from going bad again?" he says. That would require doing things Detroit has struggled to accomplish for decades, including hanging onto residents like Brunson and attracting new residents and employers. The city would also need to prove that it can keep the lights on, the buses running, and provide emergency services to its beleaguered residents.